Favorite TV Show? : Current - everybody loves Raymond and Becker - all time favourites - Fawlty Towers, M.A.S.H. and Walking with Dinosaurs. Favorite food? : Vanilla Milkshakes - extra Ice Cream. Favorite actor? : Kevin Spacey, Bill Murray & Samuel Jackson. Pet hate? : Hockey players who come to Australia claiming they "just missed their window" to the NHL. JM: Bauer Bauer Bauer & a bit of Montreal. KB: How long have you been playing hockey? JM: 25 years, jesus, that's a quarter of a century. KB: How did you get involved in the sport? JM: Dad, wanted me to play Lacrosse but they didn't have any teams that went down to an under 6's, but the local Ice Hockey Team had an under 6's team so I joined. JM: Tennis, Golf (only competitive with John Tsakmakis). KB: During your A grade tennis career did you play against anyone we may have heard of? JM: I've been absolutely demolished by some of the best. Jason Stoltenberg and Todd Woodbridge both didn't break a sweat in dispatching me in straight sets. I did get a game of Woodbridge during a Grass Court Tournament. It was my serve and I successfully dropped four serves in a row onto a dead bit of grass so the ball did a grubber after it bounced and Todd couldn't return it. That only pissed him off so he made sure I only got another two or three points for the rest of the match. KB: What number do you wear? KB: Why do you wear that number? JM: My first State Team in Connecticut gave it to me and we won our regional tournament and even though I think I got on the ice twice during that whole tournament, I kept wearing it for good luck. KB: Who is your all time favorite hockey player and why? JM: Gordie Howe, because he symbolises passion for the sport. He played professional Ice Hockey until he was 50 years old. He played because he loved playing hockey at the highest level and continued to play even though he'd made enough money to retire and live comfortably when he was 35. And of course he also played for the Hartford Whalers when I lived there in my youth. Also, ya gotta love the "Great One". There will never be an Ice Hockey player that is so far above his peers and that brings the sport to as many people as he did..
KB: Most memorable hockey moment? JM: Singing the Australian National Anthem after we'd beaten Japan 13-3 in our first ever international In-Line Hockey win at the 1996 World Champs. KB: You play both inline and ice. Which do you prefer? KB: Who is the player(s) you least like to play against? Why? JM: Andrew 'frij' Petrie because he gets into your mind as well as hurting you on the score board and he's physically intimidating. Glen Lynch, because he could take a back tooth out from one zone away before you know what happened. 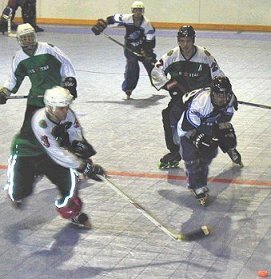 KB: What do you think Inline Hockey can do to move into the mainstream of Australian sports? JM: Lots of little things to improve the professionalism of the sport, with the goal of eventually attracting a major national sponsor. KB: What player do you most enjoy playing with? Why? JM: Heaps: On ice, Charlie Cooper, because he skates till he can't skate any more and he can do everything on the rink. Hit, Shoot, Deek and Pass. Mike Harrow from ACT because I've never played with a more determined, hard working bloke in my whole life. For Ice and In-Line, Brian Vellacott because he can score from anywhere, Daniel Gunn and Andrew Petrie because of their playmaking ability, Anthony Wilson because of his reliability in defence and dirty big shot and Tyler Lovering because he makes the right decisions on the rink all the time. For In-Line Karl Bryan for his natural ability to score, particularly in a clutch, John Tsakmakis because he's like Mike Harrow on In-Lines and Kris Gailloux because he's capable of doing it all. KB: What do you think players playing against you think about your style of play? JM: Not to sure. I think they think I've been around for a while. KB: Compare the Australian junior players to those overseas. JM: The attitudes to training. Australian Juniors have probably more natural talent than most junior sports people in the world, however, the juniors of Northern climate countries are asked to train seriously and they do it or they don't play. The result is a better knowledge of team play. KB: What do you as a day job? KB: Is it realistic to think one day an Australian hockey player is going to hear his name called in the NHL entry draft? JM: You bet. It'll take a while, but definitely one day. KB: At the end of your hockey career what will you have liked to have achieved? JM: I'd like to watch a whole Australian In-Line Hockey Game on National TV. I'll know that I did my bit to help that happen. KB: From all accounts you have the hockey talent/brain of someone who could have played professionally. If you could do it all again would you have a go at playing professionally in America, or would you stay in Australia? JM: I'm smart enough to know that even if the first part were true, which it isn't, that my life here is pretty good. I'd love to have a go at minor league pro hockey for a season or two, mainly for the experience and the knowledge, but that's all. I wouldn't want my life and pay packet to be dependent on hockey for too long. KB: Any advice to the junior players who look up to you? JM: Enjoy every second your on the rink. Because you'll have a fifteen year career and a seventy year retirement. KB: You are renowned for your funny hockey anecdotes. Give us a couple that stand out over the years. JM: Most of them involve yourself but seeing it's your website I'll spare you. National In-Line Hockey Championships in Moe in 1994. It was undoubtedly the most stunning and yet hilarious single act I've ever seen. Victoria v ACT was considered fairly straight forward affair for the Vics. The game started well for us with a few easy goals but as the game progressed the ACT players were becoming fairly effective in thwarting our offensive charges. 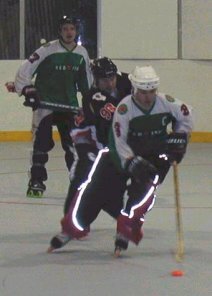 Their tactic was to skate hard, man up and at every opportunity, throw themselves bodily at both puck and player. Well, this tactic was not to the liking of our assistant Captain John Tsakmakis. His reaction was to quickly and quietly clobber one of their blokes, unseen by the ACT victim and everyone else except the referee standing right in front of the act as it happened. JT, in his usual fashion, made several noises which indicated his disapproval of the call and then reluctantly went to the penalty box with a double minor penalty. The game continued and the ACT players continued there effective, if somewhat confrontational style of forechecking. This only served to fire JT up even more. From the penalty box, he bellowed a few incoherent pleas to the referee for justice to be served against the ACT team who were still aggressively checking the Vics. Finally his pleas were heard and the refs pulled up an ACT player for interference. The ACT player "the fringe player", named so because he wore his helmet tipped so far back on his head so as to expose a big cow lick fringe, was not happy with the call and argued vehemently with the ref. JT, who had sat back down on his seat in the penalty box was quietly simmering. Like a caged lion, his pupils dilated and he started to twitch. The ACT player continued to argue, refusing to accept his penalty and in JT's mind this only served to prolong JT's stay in the penalty box. I was on the rink at the time waiting for the fringe players protest to end and as I turned to see how it was progressing, I saw JT stand up and lean out over the penalty box with his stick in both hands. He brought his stick over his head Gladiator style and donged the fringe player right in the middle of his head. The fringe player who had his back to JT went down instantly, more due to shock than injury. JT, satisfied that justice had now been served, quietly sat down back in his box with a disturbingly relaxed look on his face. The referees were frozen in confusion. They new what had happened but didn't know if the current rulebooks covered such an act.Needless to say, once they figured out what penalty to issue JT with, he didn't finish that game. JM: The only other thing interesting about me is actually about my old man playing for the Detroit Lions.